Besides a new Limited Edition Speedmaster Professional to celebrate the 40th anniversary of the 1971 Apollo 15 mission (restricted to 1971 pieces), Omega unveiled their latest addition to the Speedmaster family. The Speedmaster Omega Co-Axial Chronograph. 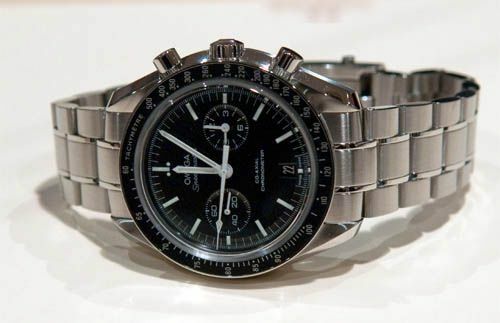 You’ve read it correctly, it says Speedmaster OMEGA Co-axial Chronograph. 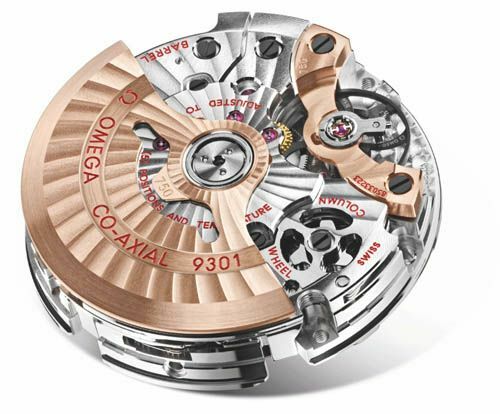 The emphasis is clearly on their new chronograph in-house caliber 9300 and caliber 9301 movements with co-axial escapement, or as they say in Switzerland ‘L’échappement Co-Axial’. The difference between the caliber 9300 and 9301 are in the finish of the movement, where the 9301 should be seen as the movement with a luxury finish like a 18ct red gold rotor and balance bridge and blackened screws, barrels and balance wheel. 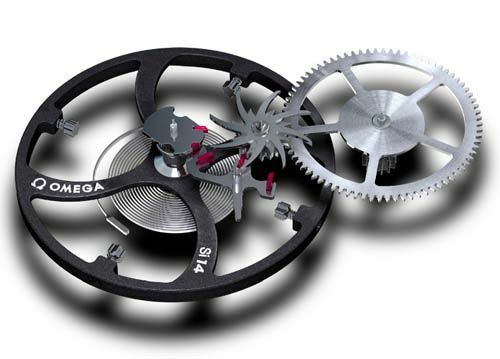 The Co-Axial escapement has been introduced in 1999 during the BaselWorld exhibition and is probably nothing new for you. However, it seems to have been the first step in a long way to become a manufature watch company. This caliber 9300 and 9301 co-axial (column wheel) chronograph movement also bear a silicon balance spring which is resistant to magnetism and doesn’t wear out any time soon. This, in combination with the co-axial escapement, will probably make sure that it will be a low-maintenance chronograph timepiece. Omega is giving a 4-years warranty on the Speedmaster Omega Co-Axial Chronograph timepieces. On with the Speedmaster Omega Co-Axial Chronograph watch! This watch clearly has the Moonwatch DNA, but is different in many ways as well. For instance, the chronograph function is displayed in two registers on the dial instead of the classic tri-compax lay-out at 3, 6 and 9 o’clock. The sub dial on 3 o’clock displays the hour and minute totalizators and the sub dial on the left shows the ‘normal’ seconds of the time. 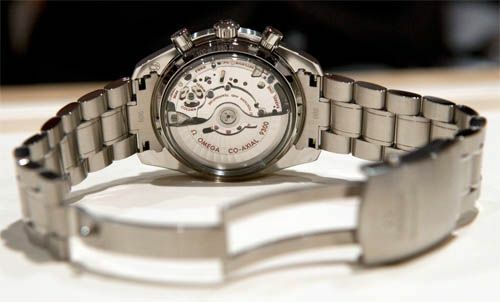 The large chronograph second hand is operated by the pushers on the right side of the case. Also different from the Moonwatch is the use of a date window. This date window is located at 6 o’clock and – thrilled to see this – using a black date disc with white numerals. As you can see, the markers for hours and minutes are similar to those of the Moonwatch dial. This also includes the design of the hands. With a case diameter of 44.25mm it is certainly not an extremely big watch for these days, but when compared to the Speedmaster Professional, it differs a bit more than 2mm. The height of the case depends on the case material. This watch is available in stainless steel, 18ct orange(!) gold and platinum. Height is 15.60mm for the stainless steel model and 15.80 for the orange gold and platinum model. The bracelet is a bit larger – or wider – than we are used to. The space between the lugs of the watch is 21mm and it tapers down to 18mm at the clasp. Keep that in mind if you want to put on a custom made strap. The platinum version has a black enamel dial and the orange gold version has a black ceramic dial, the stainless steel version has the black bevelled dial similar to the Speedmaster Professional ‘Moonwatch’. Personally, I think Omega succeeded in their mission for a Speedmaster with an in-house co-axial column-wheel chronograph movement. It is not a Speedmaster Professional and certainly no replacement for their icon timepiece. 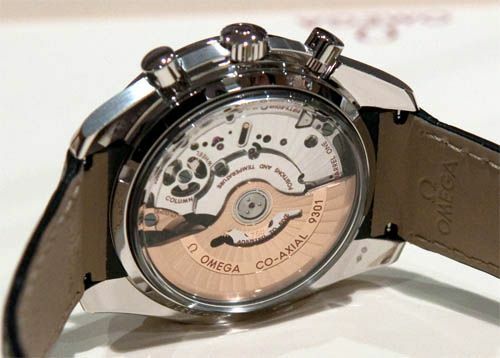 In that aspect, it is a piece of craftsmanship that clearly demonstrates where and what Omega is about these days. I could definitely own a stainless steel Speedmaster Co-Axial Chronograph besides my vintage Speedmaster Professional, for daily use and wear. The date window comes in handy and the size would suit me perfectly. The only thing I would have to get used to, is the fact that the hour and minute totalizators are combined in one sub dial. Prices start at 7.300,- CHF for the stainless steel model.